Using features such as the history memory, Wave window trigger, GO/NO GO and action-on-trigger, the DL350 enables not only faults to be detected and the data securely saved but also a notification and image of the event to be sent to the engineer wherever they happen to be. maximum of 5000. This capability is particularly useful if the characteristics of the fault are unknown and thus triggers cannot be set to trigger just on the fault condition. When all the history memories are displayed, effectively superimposed on each other, the unusual signals will appear fainter than the rest. Now the characteristics of the fault can be measured and assessed. Once the fault is characterised it becomes much more efficient to use the comprehensive range of trigger settings to just capture waveforms containing the faults and perform other actions automatically. 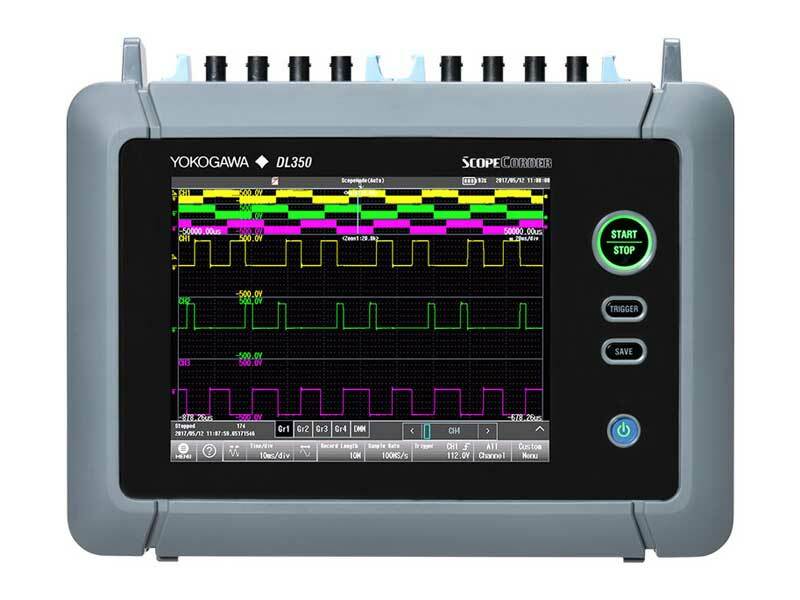 A typical use of an instrument selected to monitor the power quality of the mains is to capture phenomena such as overvoltages (or surges), under voltages (or sags), transients, and changes in phase or frequency. By using the wave window trigger, the DL350 is able to use a 40 to 1000 Hz reference to capture waveforms which fall outside of limits set around the reference. The phenomena are thus captured to the acquisition/history memory. As the DL350 also benefits from a rechargeable battery option, it can act as a UPS (uninterruptable power supply) when the unit is powered from the mains. This can ensure that the data resident in the acquisition/history memory are not lost if a mains power failure occurs. However, if the user also requires the data to be (automatically) saved to permanent memory, this is possible using the Action-on-Trigger. A local memory device such as an SD card or USB stick can be selected as the target device or even a remote network drive, if the DL350 is connected to one. In this case, both the data and the related screen image can be saved. When the user needs to be immediately notified that a trigger, and thus a fault, has occurred and the DL350 is connected to a network, the instrument can send them a very timely e-mail. Faults can have all types of characteristics. It is therefore impossible to predict the best type of trigger to use to capture any particular abnormal signal. This is a reason that the DL350 provides an extensive toolkit of enhanced trigger settings, which can be applied to suit the characteristics of the fault. This includes the creation of a trigger if something happens on more than one input simultaneously and if the width of a signal changes, for example. The GO/NO-GO function in a ScopeCorder like the DL350 is regarded by many users as a hidden gem. It effectively enables the DL350 to automatically decide whether a waveform is good or bad once it is captured. This is particularly useful if all the ‘good’ waveforms need to be captured as well as the abnormal ones, or the triggers cannot be set precisely enough as the shape or characteristics of the abnormal waveform are not completely predictable. The instrument tests the captured waveform by either considering the shape of the waveform and comparing it to one or more reference waveforms or by measuring parameters of the waveform and establishing whether they are within chosen limits. If the judgement is a ‘NO-GO’ (or a failure) the unit can again perform automatic actions such as saving the data or sending an e-mail. Up to 4 waveforms references can be employed, which can be compared to the captured waveform either using an ‘AND’ or an ‘OR’ condition, or up to 4 waveform parameters measurements can be employed on the same basis. This means that the GO/ NO-GO test conditions can be precisely tuned. The DL350 portable ScopeCorder is more than a test tool. It not only provides the ability to make field measurements with the same high levels of precision and accuracy that are achievable in the laboratory, but also enables you to take a true all-rounder with you off-site secure in the knowledge that it has the capabilities you need when you are confronted with the unusual.